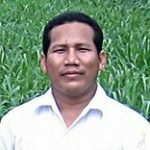 Mr Pin Vannaro, Dean of the Faculty of Agriculture at Maharishi Vedic University, Prey Veng Province, Cambodia, received the 2008 Crawford Fund Fellowship. Mr Vannaro is a university education specialist and an agronomist with research interests in tropical forages, crops (especially rice) and vegetables. He graduated in agriculture at Maharishi Vedic University in 1998, and later completed a Masters degree at Chamroeun University in Phnom Penh. He has been employed at Maharishi Vedic University since 1999 and has been Dean of Agriculture since 2000. The university has 400 agriculture students. For the Fellowship, Mr Vannaro spent 3 weeks in Australia working on the development and use of improved tropical forage plants for livestock production. The improvement of livestock production offers good potential for raising farm incomes and improving diet quality in Cambodia and is being given high priority in agricultural R&D programs. The information gained by Mr Vannaro will be built into new teaching activities on livestock and improved forages at Maharishi Vedic University and will add value to a current ACIAR project on the use of introduced forage plants to improve the productivity of cattle in Prey Veng Province. In Australia from 26 January to 13 February 2009, Mr Vannaro worked with Dr John Schiller (University of Queensland) and other highly experienced scientists from the Queensland Department of Primary Industries and Fisheries, CSIRO and the University of New England to learn various aspects of the development, evaluation and use of improved tropical forage plants. The training included visits to farms in central Queensland and northern New South Wales. Mr Vannaro also worked at the University of Queensland on the manuscript of a scientific paper he is writing on the evaluation of introduced forage plants, based on his experience in Cambodia. The forage species being introduced to Cambodia for improving beef cattle production are generally the same as those grown in areas of beef cattle production in Queensland. Thus the opportunity to visit research and educational institutions in Australia and to experience typical beef cattle properties that use these forage species in areas of southeast Queensland should help to accelerate development of technologies for improving forages and beef cattle production in Cambodia.